The royal jelly forum is where we discuss things like recommended doses, tips on how to take royal jelly, tasty smoothie recipes and my favorite, your experiences using this superfood for better health. Good or bad, we want to hear about it! This is a broad area and one of our most popular spots for visitors. And remember, no question is a bad question so ask away! Have a Question or Comment About Royal Jelly? My passion is helping people achieve perfect health using the amazing products of the hive such as royal jelly! I would love to hear about your best experiences, your most interesting information on royal jelly, your top tips on how you've used it, conditions its helped treat... anything about royal jelly that you'd love to share. Or, if you've simply got a question for me or one of the other forum members, ask away! Your question/comment will appear on a Web page exactly the way you enter it here. im 47 and trying to get pregnant. Will royal jelly help me? Can I take royal jelly shortly after coffee? How much fresh royal jelly and propolis to take? Do royal jelly capsules expire? How can I safely assess if I'm allergic to royal jelly? Which form of royal jelly is best? 3 year old with asthma - should I give royal jelly? Can Royal Jelly Potentiate Breast Cancer? Royal Jelly and taking the pill? Royal Jelly and Bee Pollen for fatigue and aches/pains? Breast lumps and royal jelly? Can I give royal jelly & bee pollen to my 6 & 10 year old? What to take for my immune system???? Does royal jelly have caffeine in it? Can I take bee pollen, royal jelly and propolis together? Royal jelly honey spread or capsules? Can I mix royal jelly with other superfoods like maca and goji? Does fresh frozen royal jelly need to be refrigerated? Yes, fresh frozen royal jelly should be refrigerated. Better yet, keep it in your freezer if possible. This will ensure maximum freshness long term. 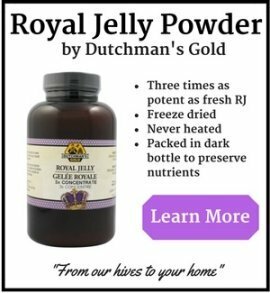 Fresh Frozen Royal Jelly or Capsules? Will boiling water hurt the royal jelly (in tea)? Taking Royal jelly internally problem. Can I take Royal Jelly while taking blood pressure meds? Can I melt my royal jelly and take it as a liquid ? Yes you can. Hi Angie Please tell me where your Royal Jelly comes from - China? Angela's Comments: Our royal jelly products are 100% North American sourced.